1 gpm COT turbine oil coalesce skids rapidly remove water from turbine oil with > 95% single pass efficiency, control particulate to 16/14/11 and lower. 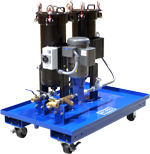 FCL turbine oil coalescing filter carts feature a large combination coalesce/separator element to remove water from turbine oil. 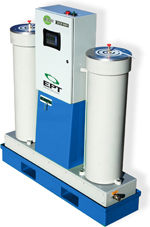 High efficiency prefilter removes particulate contamination. 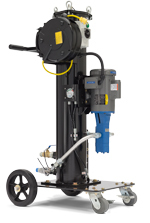 Flow rates available up to 5 gpm / 18 lpm with several power options available. 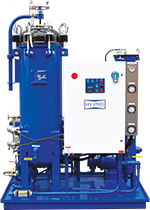 FSL dedicated off-line filtration systems feature a large element for conditioning high viscosity lube oils with high efficiency element media options down to 1 micron absolute, water removal and stainless wire mesh. 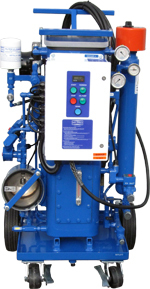 Ideal for coal mill and other gearbox applications and for cleaning & transferring high viscosity fluids. 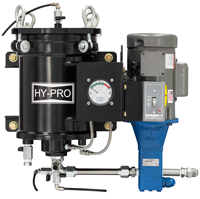 High flow rates and a range of power options. 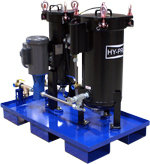 Dual stage FSL units give the flexibility to use water removal elements and high efficiency medias down to 1 micron absolute. 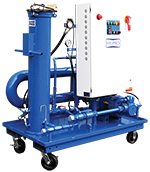 A compact dedicated off-line contamination solution ideal for small reservoirs, gearboxes and diesel engine crankcase conditioning. 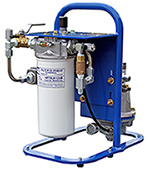 Element media options for every application including particulate removal, water absorption, varnish and acid removal. 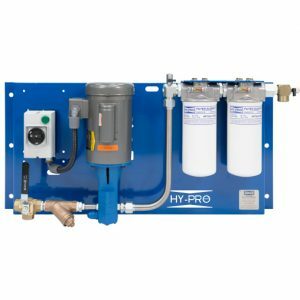 Hy-Pro’s customizable Liquid Conditioning Station will organize your lube room and ensure that contaminants are taken out of your lube oil or hydraulic fluid before it ever enters your machine. Checkout the PDF linked below for more information. 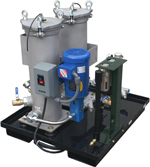 The V1 mini vacuum dehydrator equipped with heater removes free and dissolved water from small reservoirs. 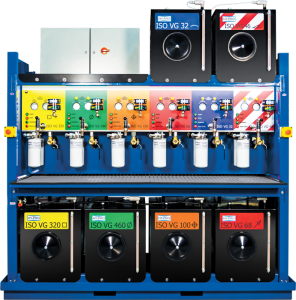 This mini version of our VUD series machines is extremely portable and can operate on a 120VAC 1P 60Hz electrical circuit requiring < 20 Amps. 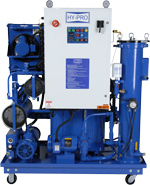 The portability makes the V1 ideal for such applications as boiler feed pumps, FD & ID fans, ferries & workboats, and any other small reservoir plagued with water contamination.